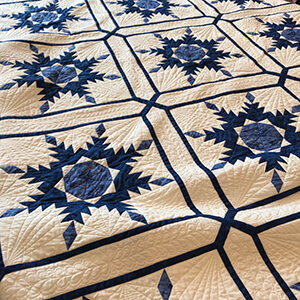 Under Sandy’s expert instruction, you will learn to make a traditional “feathered star” quilt, a favorite of quilters for many years. You will learn many tips and techniques in this class, including best practices for cutting and piecing, and how to make half square triangles so that they are accurate and on point. You’ll see that it’s not really as intimidating as it looks and the end result is absolutely stunning. We will also talk about colors, settings, sashing, and borders. Cost and registration: Call the shop to register. When you register, you will pay $15 for the shop fees for all 3 months, which will secure your spot. $75 is due to the instructor on the first day of class.